Mention “eminent domain” and ugly associations come to mind. The brutal power of the state. Taking homes and beloved ranch and farm land for development of oil pipelines, highways, powerlines, private for-profit rail lines. Destroying neighborhoods in the name of “urban renewal.” Condemnation. Recently there has been controversy over the City of Houston’s role in allowing residential development on more than 100 acres of an unused golf course on Gessner Road in west Houston just east of Addicks Reservoir. Discussion has focused on the folly (and taxpayer burden) of constructing (federally-insured) homes in a floodplain. But the more critical issue is that local golf courses, including this particular golf course, have been identified as one of the few remaining sources of undeveloped land vitally needed for detaining stormwater and reducing flooding in our highly developed city. The golf course in question, Pine Crest, drains into Brickhouse Gully, which in turn drains into White Oak Bayou. Both streams are among the top ten fastest rising streams by flow in the state of Texas, according to a recent study by hydrologist Matthew Berg. Also in the top ten is Cole Creek, which flows into the same spot, pointed out Berg in a recent interview. The decision to allow development of this open space, instead of using it for stormwater detention, is a prime example of creating a moral hazard: placing people in harm’s way knowing that others will pick up the tab for the damages. “If I had known that this piece of land was on the open market, I definitely would have at least tried to make an offer to acquire it for detention,” said Matt Zeve, as reported by the Houston Chronicle. Zeve has been director of operations for the Harris County Flood Control District since November of 2015. The land has been for sale on the open market since 2015. To make it more saleable, the flood control district has been working with the property owner, MetroNational, since at least mid-2013 to reduce the land’s flood hazard designation. 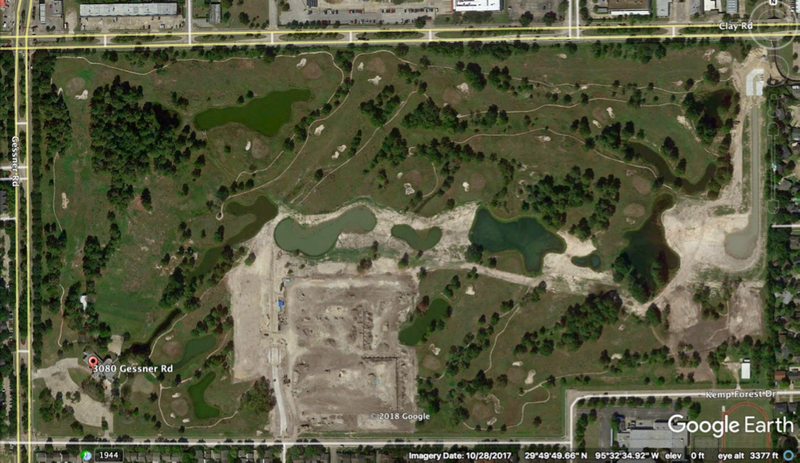 The company, a major developer in west Houston, bought the land in 1985 and completed the golf course in 1992. It was having trouble selling the land, which sat some two feet underwater in the 100-year floodplain — an area that floods during a 100-year rain event. A 100-year event is defined locally as just over 13 inches in 24 hours or just under 11 inches in 12 hours, though these long outdated definitions are changing. (Our last three floods are defined as 500-year-floods or even greater: some describe Harvey as a 1000-5,000-20,000-year flood.) With the approval of the flood control district, a plan was drawn up to engineer the land out of the 100-year floodplain, according to documents obtained through a Public Information request by a member of Residents Against Flooding. By the beginning of 2017, the majority of the land was sold to Arizona-based Meritage Homes, which plans to build some 800-900 homes there. MetroNational plans to build a commercial development on the remaining 35 acres. Increased development and unprecedented rain forced the emergency opening of the dams’ floodgates during Harvey in August 2017. The disaster flooded thousands of homes along the bayou, destroying thousands of lives and killing three people. It was merely a foreshadowing of what could come. The politicians have the power. What’s needed is the will. It’s a classic moral hazard, of privatizing the profits and socializing the losses. Local authorities make planning decisions putting residents in harm’s way and leave it up to the federal taxpayers to pick up the tab for the damage. For the Public Use: If Not Now, When? Bridgeland Development office west of the Grand Parkway in the Cypress Creek overflow area between the creek to the north and Addicks Reservoir to the southeast. 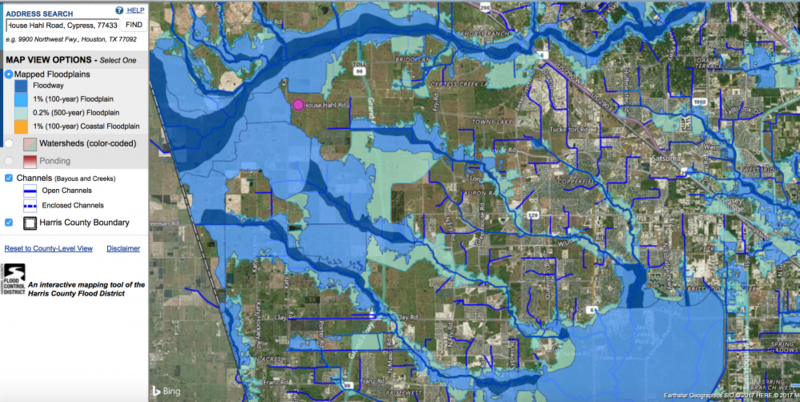 Harris County Flood Control District map showing the flood zones in the area platted for development by Bridgeland west of the Grand Parkway. Dark blue is floodway. Light blue is 100-year flood zone. Green is 500-year flood zone. Pink dot is Bridgeland office. Eminent domain is intended to be used for the public good. It is the power of the state, granted to the county and city, the flood control district, along with numerous other agencies public and semi-private, to purchase property at a fair market price from an unwilling owner for a public use. Eminent domain is NOT buying out homes deep in flood hazard areas that continually flood, though just recently use of eminent domain has been mentioned by officials frustrated by the slow pace of the buyout process. Local buyouts are generally funded partly with federal funds, largely Federal Emergency Management Agency funds, and the federal government does not allow the use of FEMA funds for eminent domain. FEMA does encourage the use of eminent domain, using local public and private funds, when necessary for flood protection and creation of public green space (p. 17), and even promotes the benefits of acquisition. (pp. 12-13) Buyouts, however, usually conducted by the Harris County Flood Control District, are voluntary. A frequent argument in favor of development at all cost is that the cash-strapped (and park-poor) city desperately needs the improved property tax base for revenue. (Property taxes account for nearly half of the city’s general fund revenues. p. 4) But a long-known fact is that parks and green space also improve the value of surrounding property – by as much as 15 percent, according to the City Parks Alliance. There’s also the cost savings in stormwater management, air pollution reduction, and health benefits, as well as the significant reduction in property and personal losses from flooding. Perhaps we should consider reduced loss of reputation for the city as well. Houston, by the way, ranks 81 out of the top 100 U.S. cities in park space, spending, and accessibility, according to the Trust for Public Land. The city ranks number one in severe repetitive property losses to flooding. Some even argue that suburban residential development is a net drain on the city budget over the long term due to the cost of maintaining and replacing basic services and infrastructure. Charles Marohn, an engineer and founder of Strong Towns, calls it “an illusion of wealth.” He also has written specifically about Houston and Harvey. In January 2017 the Harris County Appraisal District assigned a market value to the MetroNational Pine Crest golf course land at around $18,000 an acre. So purchasing the 150-acre property could cost about $2.7 million. What about the prairie land out west already platted and continuously being platted for development along the Grand Parkway north and west of Addicks Reservoir? Much of this land is in what’s called the Cypress Creek overflow area, some 21,000 acres of mostly agricultural land that is difficult to develop because it is inundated by as much as several feet of runoff overflowing from Cypress Creek to the north during storms. Most of this runoff, some 23,355 acre-feet or 2.7 billion gallons during your basic heavy (100-year) storm, (p. 14) within two to three days eventually ends up in Addicks Reservoir on Buffalo Bayou, which couldn’t handle the rain from Harvey, much less increased runoff from development of land currently providing some form of detention. Addicks, like Barker, a normally dry reservoir used for flood control, can hold 130,203 acre-feet of stormwater before it starts flooding the subdivisions developers built close behind it. To solve the problem of extracting profit from land being inundated by the overflow (and the separate problem of serious flooding downstream on Cypress Creek) politicians and developers are proposing costly engineering projects like $400 million for a Third Reservoir or even maybe a Fourth somewhere out there on Cypress Creek. Such dam projects, however, would be a federal responsibility through the Corps of Engineers. There are also wild ideas for building underground tunnels, canals, and widening and straightening Buffalo Bayou to let more water drain faster out of the dams. Then there are more practical proposals for a levee along the back of the reservoirs to protect the homes built inside the flood pools and for dredging and deepening the reservoirs themselves. (The latter, however, is also a federal responsibility.) These projects would cost billions to build, millions to repair and maintain. And in the case of new dams, like our old dams, they also hold the certainty of aging and of becoming inadequate, and the possibility of future failure. 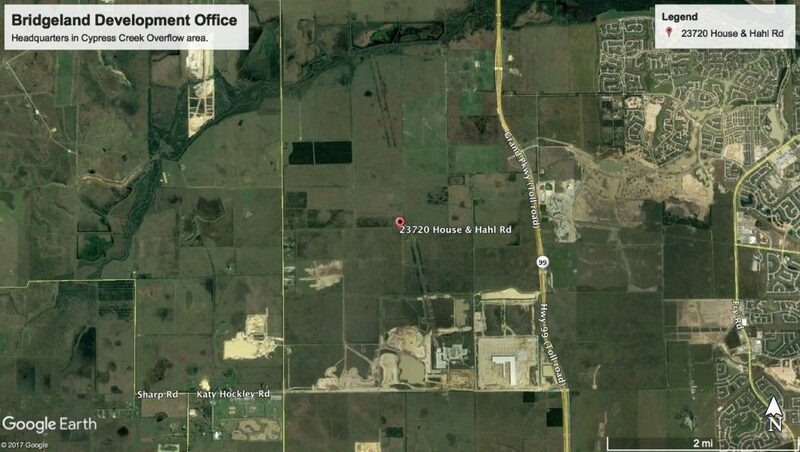 The Harris County Appraisal District assigned a January 2018 market value of $7,679.50 an acre to agricultural land owned by Bridgeland Development Corp. west of the Grand Parkway between Cypress Creek and Addicks Reservoir. Bridgeland, which is managed by The Woodlands Development Company, is a division of the Howard Hughes Corp. Bridgeland, which has already developed residential subdivisions east of the parkway, owns a significant amount of the land in the Cypress Creek overflow area. So buying all 21,000 acres in the overflow area could cost about $161 million. A lot cheaper than building reservoirs, canals, or tunnels or deepening and widening Buffalo Bayou, which experts agree doesn’t work to reduce flood risk anyway. And what a beautiful park we could have­— our native prairie once had grasses that stood eight-feet tall! This park, which if restored (restoration cost estimate not included) to a mix of one-third wetland and two-thirds grassland prairie (pp. 872-873) could store naturally as much as 50,000 acre-feet of stormwater. Harris County is planning to hold a vote on August 25 for a bond issue to provide some $2.5 billion for flood reduction projects. County commissioners haven’t yet decided what to spend it on.